Jumping into a season midstream for a serialized show is never easy. Doing so for a series as complex and layered as Fringe is even more daunting. Always up for a challenge so into the breech I step. Before I jump into this review a brief statement of orientation of my views on Fringe is needed. It should help you decide whether you feel my reviews will be worth your while. It is all about providing context because in isolation, words and thoughts can be misconstrued. So consider this opening of a new review restaurant and allow me to walk you through the specialities that I am serving. On the surface Fringe is a textbook example of a show finding its place, feeling out how best to use its characters and stories. It then married the two of them together creating a launch pad to ignite and lift off a multi-season serialized story. Beneath the surface there may be more than a kernel of truth to the conceit that the show was testing the waters to see if it could recapture some of that X-Files fan base by serving up a procedural monster of the week show style. Once the show ascertained the size of its core audience it made the slow transition from stand alone to serialized. Happily, the show was not wasting any air time during its more stand alone phase. Huge swatches of foundational story mythology was laid down; the Pattern, ZFT, and the Observers for examples. The show then focused on a subset of that mythology; the concept of parallel universes and the show is where it is now. 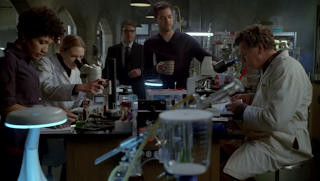 The showrunners constantly point out that they have six or eight seasons worth of material. The pieces are all there right back to the pilot. This makes rewatching the earlier seasons a very rewarding experience. Every episode is a thread in a larger tapestry. The emotional engagement for the characters that was not there until such episodes as Jacksonville, Peter, and Subject 13 make those beginning episodes a brand new experience. Fringe lays story points down in one season leaving them dormant until later seasons where they spring back to life, often in the most dramatic ways possible. Stowaway is another such episode. At the end of the previous episode, Os, Olivia’s Soul Magnet laced cup of tea served up by William Bell in the other universe back in Season 2, Episode 4 – Momentum Deferred; is gonged by back to life by Walter. Olivia now becomes Bellivia and Walter is overjoyed that his childhood friend is back. Back to help Walter find a solution to saving the universe and Peter. However Bell does not seem to share Walter’s vision of the shape of things to come. Bell tells Peter that by trying to escape his fate, Peter may be very well be taking the path that will lead him to his destiny with the Machine. Azarael Archangel of Death – seeds for future story? Bell offering Peter a pot of tea. Only on Fringe could something so innocuous become so sinister. It is rather amusing to see viewers upset about the lack of credible science, or even pseudo-science, to back Bell’s theories about the soul being indestructible energy that can be attracted to a host body by Soul Magnets. Amusing because in Stowaway the notion that someone can become indestructible by being struck multiple times by lightning hardly raised any eyebrows, Terran or Vulcan. I am struck with my own ironic amusement that I have come aboard FringeTV to review Fringe and start with my least favorite episode of the season. Especially in a season filled with an almost unending streak of exceptional episodes. Such is my fate or destiny it seems. My disenchantment with this episode is in part due to the indestructible lightning premise. Also in part due to guest Paula Malcolmson taking her series long arc from Caprica and reprising it in a condensed form in one episode of Fringe. My biggest issue with this episode is the lack of forward story movement. Stowaway revisits the fate versus free will themes. Again. Without adding anything new. Further disappointment arises with how Bellivia is utilized in this episode. With a handful of episodes left in the season this one was a golden opportunity to use Bellivia to reveal either some show mythology or Walter backstory or both. Instead Bellivia is restricted to trading quips and joints with Walter while making verbal or suggestive gestures with Astrid. The most intriguing aspect of Stowaway was the concept of the Archangel Azrael, the Angel of Death, and a possible thematic tie-in for Peter and/or Olivia. Story seeds may have been planted here. When they will bloom could be several episodes or seasons down the road. Of special note is Anna Torv’s portrayal of a William Bell possessed Olivia. In a season of excellent acting opportunities, Anna has risen to the challenge every single time. Her impersonation of Leonard Nimoy’s speech patterns and cadence was amazing. And this is coming from some one who grew up with Nimoy and the original Star Trek. Brilliant. Just brilliant. I will touch upon more season long items and be more episode centric in subsequent reviews. For now, thank you for your patience with this inaugural review. I look forward to sharing my thoughts with you here with the rest of Season 3.